Edith Constella Wallace was born on August 26, 1937 in Calvert County, Maryland to the late Grant S. (Winnie) and Hilda V. Wallace. She was the fourth child of nineteen children (16 girls and 3 boys). Edith peacefully entered eternal rest on Wednesday March 13, 2019. Edith attended Mt. Hope United Methodist Church during her early years where her father Mr. Grant S. Wallace served as a Sunday School Teacher. The Wallace family later moved their membership to Bethel Way of the Cross Church. Edith was a faithful mem- ber of Bethel Way of the Cross Church for over 60 years. Edith had a big heart and a big beautiful smile; she was the oﬃcial babysitter for many of her nephews especially for Jessie Jr. and Bryant Parker. Edith enjoyed all of the staﬀ and many friends at the Senior Pines in Prince Frederick, Maryland. She enjoyed socializing, shopping, going to the movies, trips to Sight and Sound in Philadelphia, Pennsylvania, eating good food, playing bingo and doing Arts and Crafts. Edith formed a close relationship with Eugenia Waul from the August Home Care who took very good care of her. Edith enjoyed attending regular Sunday Services and other programs as well, listening to Bishop Darnell Easton on Comcast and watching The Steve Harvey Show. Edith leaves to cherish her memories: Dorothy Hall (Leon-deceased), Agnes Jeﬀerson (Alfred), Aubrey Wallace (Elizabeth), Thelma Jones (Arthur Lee), Dale Morsell (Timothy), Rondallyn Wallace, Oswald (Tommy) Spriggs (Rita)-(Nephew raised by her parents); Aunts: Nina Reid, Helen Ray and Shirley Jones. 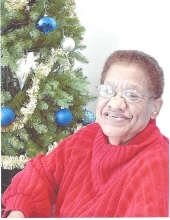 Winnie adopted the family of Brother Joseph and Sister Viola Easton Sr. as his extend family. (As if nineteen children were not enough!!). A host of nieces, nephew, cousins and especially her church family and friends. Edith was preceded in death by her brothers and sisters: Wilson, Rosemary, Janice and Stanley Wallace; Martha Jones (Floyd), Willa Mae Plater (Kenneth), Arie Ida Hall (Paul), Ruthia Jones and 4 siblings (died at birth). To send flowers or a remembrance gift to the family of EDITH CONSTELLA WALLACE, please visit our Tribute Store. "Email Address" would like to share the life celebration of EDITH CONSTELLA WALLACE. Click on the "link" to go to share a favorite memory or leave a condolence message for the family.